New York State is actively working to expand the breadth of recreational offerings along 11 miles of waterfront on the Upper and Lower Niagara River– all to extend visitor stays and associated economic benefits. The City of Niagara Falls has 11 miles of waterfront on the Upper and Lower Niagara River comprised of four State Parks and including underutilized historic structures. This initiative seeks to expand the amount and types of public outdoor recreational offerings—and facilities to support such activities—along the Niagara River to entice visitors to extend their stays in the region. This could include a reuse of underutilized historic structures for venues like outdoor gear rental and food/beverage facilities; redefinition of the Niagara Gorge Discovery Center from a small museum to a true gateway facility to facilitate hiking, birding, rock climbing, rappelling, zip-lining, and fishing in the Gorge and at other State Parks along the Gorge rim; new/enhanced trail heads; as well as facilities to support winter activities like cross country skiing and snow shoeing. 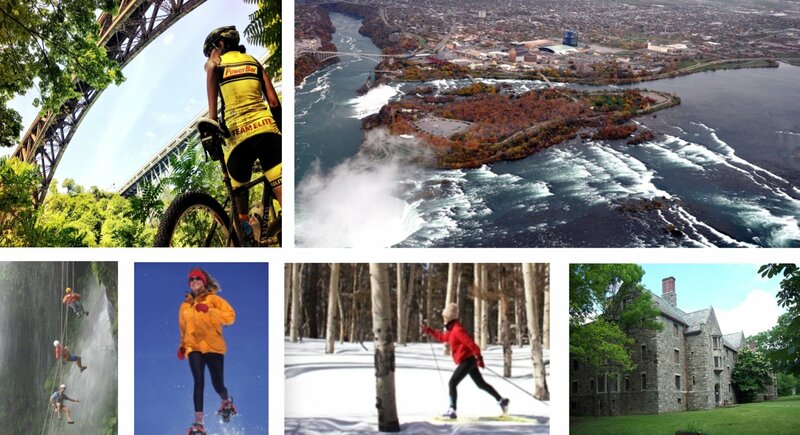 New York State is prepared to make funds available, as appropriate, under the Governor’s Buffalo Billion investment strategy to assist in achieving a bold expansion of public outdoor recreational offerings along the Niagara River. Completion of $75M in State Park improvements that will facilitate outdoor activities. Completion of the $35M improvement to create winter storage/maintenance facilities for the Maid of the Mist, which created new summer public elevator access to the base of the Niagara Gorge. Announcement by Governor Cuomo of full State funding ($42M) for the removal of a two-mile expressway segment of the former Robert Moses Parkway/Niagara Scenic Parkway along the Niagara Gorge rim between Niagara Falls State Park and Whirlpool/DeVeaux Woods State Parks (to be completed early 2020). USAN, in partnership with the New York State Office of Parks, Recreation and Historic Preservation (NYS Parks) and the New York Power Authority (NYPA), issued a Request for Proposals (RFP) for a qualified master licensee to establish, operate and maintain a program of outdoor recreation activities and associated capital/real estate facilities within four State Parks and on New York State-owned open space and land along roughly 11 miles of waterfront on the Upper and Lower Niagara River in Niagara Falls, N.Y. Proposals were due to USAN on September 15, 2017 and are currently under review. Niagara Falls attracts millions of visitors every year and by improving recreational activities in the area, New York State is supporting this vital tourism industry by continuing to grow the local economy. This exciting new programming will be designed to increase the number of visitors and boost the tourism economy of the City of Niagara Falls by extending the stays of visitors.